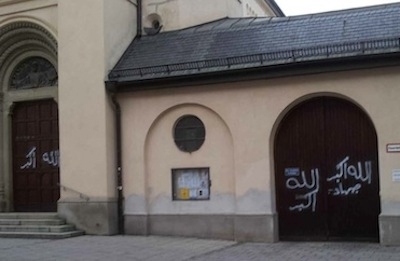 One of several German churches recently defaced with the Arabic declaration "God is great!" Several are the important lessons learned from last year's "Brave German Woman" incident. Context: On November 10, 2013, a Muslim imam was invited to give the Islamic call to prayer inside the Memorial Church of the Reformation in the city of Speyer, Germany—a church dedicated to honoring Martin Luther and the Protestant Reformation. "Until the imam started with his shouting ["Allahu Akbar! "], I did not really know what to do. I was just prepared for what God wants me to do," she told CBN News. For more details on this story, check out CBN News' various interviews and videos of and with Mund. Mund's observations about the phrase "Allahu Akbar" are spot-on. Islam's war cry, signifying the superiority of Muhammad's religion over all things, the takbir ("Allahu Akbar"), is habitually proclaimed in violent contexts, specifically attacking and slaughtering non-Muslims, whether beheading "infidels" or bombing churches. Muhammad himself used to cry it aloud prior to attacking non-Muslim tribes that refused to submit to his authority and religion. Accordingly, Mund's outrage at hearing an Islamic imam hollering out Islamic supremacist slogans is justified. Proclaimed in a church, "Allahu Akbar"—which in translation literally means "Allah is greater [than X]"—means "Allahu is greater than the Judeo-Christian God of the Bible, and Father of Christ." And assuming the imam proclaimed Islam's credo or shehada as is standard in the Muslim call to prayer (that "there is no god but Allah and Muhammad is his messenger") that too is tantamount to declaring that the biblical God is false, and the message (or Koran) delivered by Muhammad—which includes a denunciation of Christ's divinity, death, and resurrection—is true (see for examples Koran 4:157, 4:171, 5:17, 5:116, 9:30-31, 19:35). This is precisely what the vandal who earlier painted in Arabic the phrase "Allahu Akbar" across the door of another German church likely had in mind. Yet despite all this, despite the fact that only two or three generations ago, almost every Christian would have been incensed to hear a Muslim shouting Islamic slogans that by nature contradict Christianity inside a church, Mund was chastised by fellow Christians for her stand and kicked out. This speaks volumes about how far Western European nations have plummeted into a cesspool of moral relativism, where even in prominent churches Christian truths are attacked, and those who take a stand are ostracized for being "intolerant"; it speaks of the naivety and nihilism that predominate in the West; of the effects of years of brainwashing and indoctrination in the name of "multiculturalism," crippling the ability to think rationally; of how political correctness has censored not only words but the ability for people to connect-the-dots in the quiet of their own minds. There is, however, a flipside to all this: Mund's video denouncing the imam "went viral," says CBN News, signifying its appeal; and many who saw it interpreted her actions as "brave"—hence the appellation. "Bravery" often refers to an act that, while laudable, few have the courage to do. That this title is so naturally and widely applied to Mund suggests that there are many who agree with her; they just lack the same courage, or conviction, to take a vocal stand—hence why she is the "Brave German Woman." The fact is, beneath Western Europe's nihilistic veneer, many there would agree with Mund's sentiments. Not all are sheep. But due to the aforementioned forces—decades of indoctrination in militant secularism/atheism, multiculturalism, Christian-bashing, and political correctness—they are unable to articulate their grievance. Yet, whether they are able to express it or not, they remain disgruntled at Muslim affronts and weak responses from European elites. After all, Muslims hollering Islamic slogans inside European churches is not quite an infrequent phenomenon. Last Christmas, the Chaplain of Royal Holloway University invited a veiled Muslim woman to read Koran verses during church service, again, despite the fact that the Koran contradicts the key tenets of Christianity. Sometimes Muslims "invite" themselves to churches. Thus, days ago, also in the UK, a Muslim man—"dressed like a terrorist" and wearing a bandana with the Arabic phrase, "Allahu Akbar"—entered a church during service and started yelling things like "this is rubbish, you should be preaching Allah, turn to Islam, we send boys of 10 to war." And last Easter in France saw a Muslim man dressed in traditional Islamic attire enter a church during mass, set up his carpet next to the altar and start reading the Koran. This is to say nothing of the violent crimes and rapes Muslims are increasingly responsible for in Europe. The point is, more and more Western Europeans are becoming disgruntled, even if most are not yet "brave" enough to show it, and even if the powers-that-be, including media and government, continue to downplay and suppress them. Days ago, for example, Britain's Liberty GB party leader Paul Weston was arrested and is facing up to two-years' jail time simply for quoting Winston Churchill's unflattering observations about Islam in public. In short, time will tell whether the powers-that-be will allow legitimate criticism of Islam to vent in Europe, or whether they will continue to suppress it—until the simmering cauldron of discontent spills over in ways much more dramatic than quoting Luther or Churchill, as has happened all too often in European history.